With 100 racers signed on, KZ2 is the category with the greatest support in this 23rd edition of the Winter Cup. The timing of the kermesse, at the start of the season, also makes it attractive to "formulists", who take advantage of the opportunity to train for the start of their own championships. This year, in fact, there will be 6 drivers who've moved on to single-seaters taking part in the race: Antonio Fuoco and Callum Ilott on Tony Kart/Vortex of the Factory Team, the Lorandi brothers, Alessio and Leonardo, and Giuliano Alesi, son of Jean, with the same material but on the Baby Race team, and Pal Varhaug on CRG/TM of CRG's Dutch division. The Winter Cup will also see the European debut of two-time KZ world champion Paolo De Conto (CRG/TM), who will try to bring home the success that escaped him last year by only one tenth of a second to Jeremy Iglesias (FK/TM). Eyes, too, on the official Sodi duo, Anthony Abbasse and Alex Irlando, with the latter winning at Adria in the first of the WSK Super Master Series. 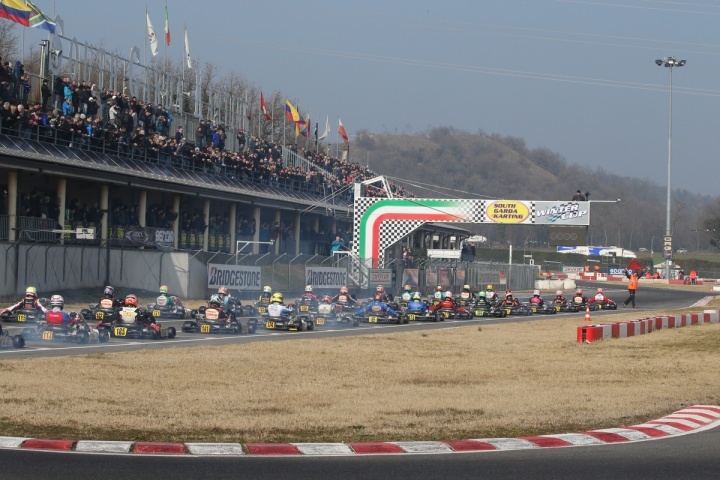 While the race at Adria Karting smiled on the driver from Locorotondo, for the Tony Kart duo of Simo Puhakka and Matteo Viganò, the epilogue was bitter and both are called to redeem themselves on the 1200 meters of South Garda Karting. Who holds the winning number in this roulette wheel at this forthcoming Winter Cup? We'll just have to wait for Sunday to find out.